Alimony goes by many names, such as spousal support and spousal maintenance. 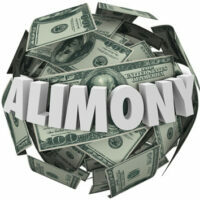 There are many different types of alimony, but at their core they remain the same. All of them include money paid by one ex-spouse to the other after a divorce. Florida recognizes six types of alimony, and it is one of only a few states that can require the supporting spouse to continue making monthly alimony payments to his or her ex indefinitely. Permanent alimony might be the type that gets all the press, but in practice, judges only award it in very specific circumstances. Factors that determine what type of alimony is awarded include the length of the marriage and the current and potential future income of each spouse. If you are trying to reach an agreement with your spouse about how to transition out of the financial partnership you shared during your marriage, keep reading to see which type of alimony seems most appropriate to your situation. Temporary Alimony – This type of alimony, paid in monthly installments, lasts only as long as the divorce case is ongoing. Once the court issues the divorce decree, the alimony payments stop. Bridge the Gap Alimony – Bridge the gap alimony can last no more than two years, and it begins when the divorce is finalized. Its purpose is to help the supported spouse tie up loose ends financially, such as selling the marital home. A good candidate for bridge the gap alimony is a former stay at home parent who needs to renew her professional license to return to her previous career after the divorce. Rehabilitative Alimony – Rehabilitative alimony requires the supporting spouse to pay for the supported spouse’s professional training in order to make the supported spouse financially self-sufficient. It requires the spouses to draft a plan indicating how long the chosen program of education will take and how much it will cost. Lump Sum Alimony – The supporting spouse pays the supported spouse the entire amount of alimony as a one-time payment, usually at the time the divorce is finalized. Durational Alimony – Durational alimony is new in Florida as of 2010. It is paid in monthly installments for a finite period of time. The duration of the alimony payments varies from one couple to another, but it cannot exceed the amount of time that the couple was married. Permanent Alimony – Permanent alimony is where the supporting spouse pays the supported spouse a monthly payment as long as both of them are alive. It is usually awarded only to people who were married for more than 17 years. Most recipients of permanent alimony have reached the age of retirement or will reach it soon. Judges tend only to award this type of alimony to people younger than 60 if they have a chronic medical condition or other life circumstance that would prevent them from working full time or earning a sufficient income. Do you have questions about alimony in Daytona Beach? Our skilled attorneys have significant experience in Florida family law, and we are eager to advocate aggressively on your behalf. Contact us today at Bundza & Rodriguez for professional assistance.